Potluck Sunday is a weekly tradition my close friend Jodi started – bringing friends together to share their favorite dishes, laugh, eat and be merry every Sunday. I cover Potluck Sunday frequently and is a staple here on this blog. Follow the previous Potluck Sunday posts here. This past Sunday our theme for Potluck Sunday was pizza! Our group was small this Sunday, but for the seven of us there were five individual homemade pizzas (plus, a dessert one). 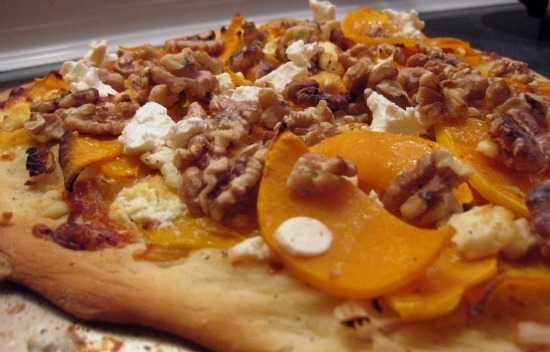 I came up with a squash pizza with goat cheese and toasted walnuts, inspired by a similar one on Food & Wine. One of our friends made dough from scratch and he made two extra for me and the man, but you can always use store bought dough. I included my squash pizza recipe below and delicious photos of everyone else’s pizza. Preheat the oven to 500°. In a small bowl, combine the 1 tablespoon of olive oil with the minced garlic to create a garlic olive oil. 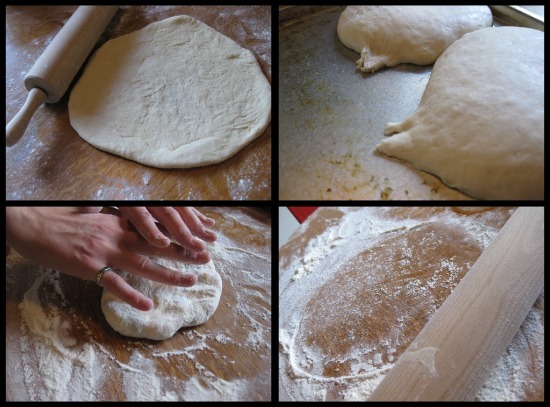 On a lightly floured work surface, roll out the dough to form a 12-inch round, 1/4 inch thick. Mine (as you will see) wasn’t round. I like to call it creatively round. This is an art, my friends. Brush the round with the garlic oil and sprinkle crushed red pepper, salt and black pepper on the round. Caramelize the onions in a separate pan and then scatter the onion slices over the round and top with the mozzarella. Arrange the squash slices on top in a single layer, overlapping them slightly. I used a mandolin to thinly slice the squash (see red mandolin above). You could also use a vegetable peeler. Finally, crumble goat cheese across the top. Slide the pizza onto a pizza stone or baking pan and bake for about 20 minutes, until the bottom is crisp and the squash is slightly browned. While the pizza is cooking, toast the walnuts (dry). After ~20 minutes, remove the pizza; sprinkle with the walnuts and drizzle with olive oil. There’s mine at the top left. The toasted walnuts were delicious! Jodi made a sauceless (like mine) with fontina, romano, parmesan, mashed potato, rosemary garlic potato wedges, extra virgin olive oil and scallion pizza. I loved the potato textures. The man made the chicken, sweet potato, jack and cheddar cheese over a spicy, spaghetti sauce with oregano, ground pepper, garlic and half a jalapeno. His pizza was messy and flavorful! Michael made his pizza with heirloom tomatoes, fresh garlic, kalamata olives, arugula and shaved pecorino. Finally, dessert-as I say, sweet morsels. 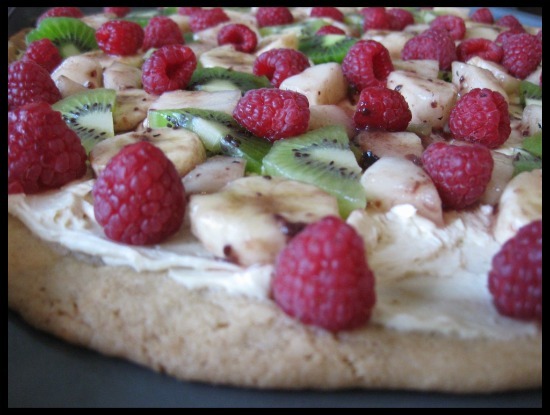 Alek made this with a cream cheese base on a enormous sugar cookie with kiwi, banana, raspberries and pears. Recipe ideas here. Homemade pizza is one of my favorite easy but delicious dishes. If you’re feeling lazy, you can even buy the boboli pizza crust (already baked) then add your own toppings. What kind of pizza do you love to make? YUM. 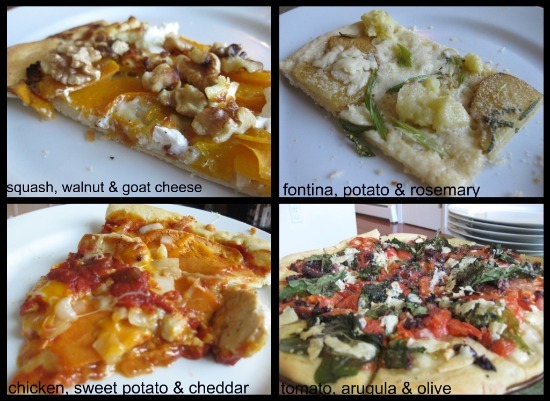 Squash/goat cheese pizzas have been a favorite around here this fall as well. I usually roast the squash first, but I LOVE the idea of slicing it thin with the mandoline, and just allowing them to cook with the pizza – definitely going to have to try that soon! Jenn, I thought about roasting the squash first (maybe it would add more flavor…) but these turned out great. There was less prep time, subsequently. This is great! Funny enough, my boyfriend and I regularly have pizza challenges with each other. His pizzas always include lots of meat (bacon, sausage, pepperoni… the works) and mine usually involves lots of veggies and fancy cheeses. I love this Potluck Sunday idea! Laurie that sounds like fun! I am BIG on artisan cheeses and I don’t eat red meat so there’s a lot of creativity still allowed. Potluck Sunday is so fun – I wrote an intro post on it which you might have seen: http://gracefullplate.com/potluck-sunday-an-introduction/ since we do it every Sunday. It’s a great way to get together over good food and a good start to the week!